Not a local snake, but a python seen in Canberra - Cluan's photo. Instead we went to Kingston again in similar weather to our last walk – that is, there were a few spots of rain and some very dark clouds which completely obscured the beautiful views of sea and mountain which we were promised upon reaching the top of Picket Hill. Still, quite a pleasant walk amid rustic scenery and flanked by flowering dog roses. It wasn’t till we got home that I read the article my son had sent warning about snake sightings in Kingston as well. I have an unholy fear of snakes. It's a bit irrational really as I have in fact seen very few snakes and they kill very few people, far fewer than those who die from anaphylactic shock after being stung by bees and the like. Indeed, domestic ladders cause ten times more deaths annually than either sharks or snakes, with drownings - about 5,000 in all over the same ten years of study, topping them all. Of around 3000* people who were bitten by snakes, there were only two deaths. Nevertheless, we have had some warm weather at last and there have been plenty of sightings, both here and on the mainland, such as the snake which visited a Canberra shopping centre recently for spot of Christmas shopping. All Tasmanian snakes are deadly but that said, they usually do their best to stay out of the way, though there is always the chance of disturbing one while leaping over rocks and logs or scrunching through leaf litter or long grass. This why you should always wear fully enclosed shoes and long pants when you go bushwalking, even if you would much rather be wearing shorts and thongs (flipflops to UK readers). All snakes in Australia are protected, so you should never try to kill one either, unless it’s say, in your kitchen, in which case you may have a reasonable defence. Mostly you should just wait until it goes of its own accord as the following clip suggests. Many of the recorded snakebites occurred while people were trying to kill them or pick them up. 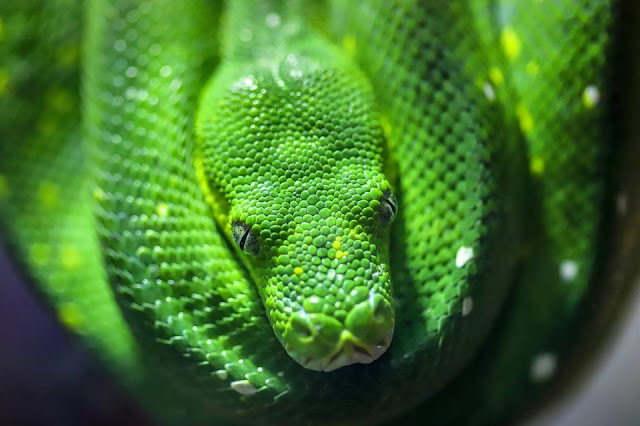 Among the reasons people now rarely die of snakebite, is that we know much more about how their venom works and because there are much more effective treatments. In the first place you must keep the patient absolutely still since the venom moves through the lymph system before hitting the blood stream (and not all bites result in envenoming) and to prevent this happening, you should bind a compression bandage firmly but not too tightly about 10cms above and below the bite. Don’t wash it either and don’t try to extract the poison by any means, which was the old course of action. If the bite is on a limb, bandage right up it to the groin or armpit and then get help. It is no longer necessary to identify the snake as the new antivenom covers all contingencies – this is the other reason why people rarely die. I am indebted to my ex -sister in law, a nursing professional for this bit of information. Link to the full article here. Ironically, over half the snake bites recorded in Australia occurred in urban areas and aound homes and not while bushwalking, which should be somewhat reassuring but isn’t. I mean, what if you are in the other half? If you do meet one in your garden or shed, leave it alone and call a snake catcher. Your local council or Parks and Wildlife Service will know where they are. * These figures seem excessive (as do the ones for drownings) as you seldom hear about snakebites, yet I have checked several sources and they all quote the same numbers. Australian Geographic puts it closer to 100 a year of actual snake bites as opposed to 1,548 suspected bites. In either case only around 2 per year prove fatal. Note also what this article says about using CPR in the event of collapse.